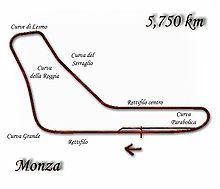 The 1970 Italian Grand Prix was a Formula One motor race held at the Autodromo Nazionale Monza on September 6, 1970. It was race 10 of 13 in both the 1970 World Championship of Drivers and the 1970 International Cup for Formula One Manufacturers. The race was marred by the death of Jochen Rindt, who died during the qualifying session on September 5 and went on to be Formula One's only as to date posthumous World Champion. The 68-lap race was won by Ferrari driver Clay Regazzoni after he started from third position. Jackie Stewart finished second for the March team and Matra driver Jean-Pierre Beltoise came in third. This was the last time that Monza was driven for 68 laps. From 1971 onwards, the race distance would be 55 laps. First Grand Prix win for Clay Regazzoni. Jacky Ickx, Clay Regazzoni, Jackie Stewart and Pedro Rodríguez all led the race at some point; during the entire race, the lead changed 28 times. First points for François Cevert. ^ "41st Italian Grand Prix". Motor Sport: 32. October 1970. Retrieved 2015-07-30. ^ "Jochen Rindt". Archived from the original on 3 July 2016. Retrieved 3 May 2017. ^ "1970 Italian Grand Prix". formula1.com. Archived from the original on 2 February 2014. Retrieved 22 December 2015. ^ a b "Italy 1970 - Championship • STATS F1". www.statsf1.com. Retrieved 18 March 2019. This page was last edited on 18 March 2019, at 16:28 (UTC).